With demolition efforts at Hayward Field complete and the project entering the construction phase, the University of Oregon is moving forward with a community initiative to determine how best to reuse materials salvaged from the historic track and field venue. A concerted effort is being made to incorporate the majority of the items salvaged from the Hayward Field into the new 12,500-seat stadium, which is set to be completed in time for the USA Track and Field Olympic Trials in 2020. Salvaged elements of the field will be used to showcase the rich heritage of the original stadium through venue graphics and signage as well as exhibits in the project’s new 4,000-square-foot museum. For most of the remaining materials, an advisory committee comprised of campus and community stakeholders will be established to develop a public engagement process, review proposals and ultimately make recommendations on how to distribute salvaged items. All salvaged materials are currently being stored, inventoried and categorized. It is anticipated that the construction team will determine which elements will be used within the new project by early 2019. The Hayward Field salvaged materials community advisory committee will begin meeting this fall to create a criteria for distribution, plans for meetings, and processes and systems for submitting and collecting proposals from the public. The UO will provide administrative support for the advisory committee. More information will be available in the coming months. To stay up to date about the advisory committee and overall project, visit hayward.uoregon.edu. Fully funded by gifts from Penny and Phil Knight and more than 50 other donors, reconstruction of Hayward Field began in the summer of 2018. 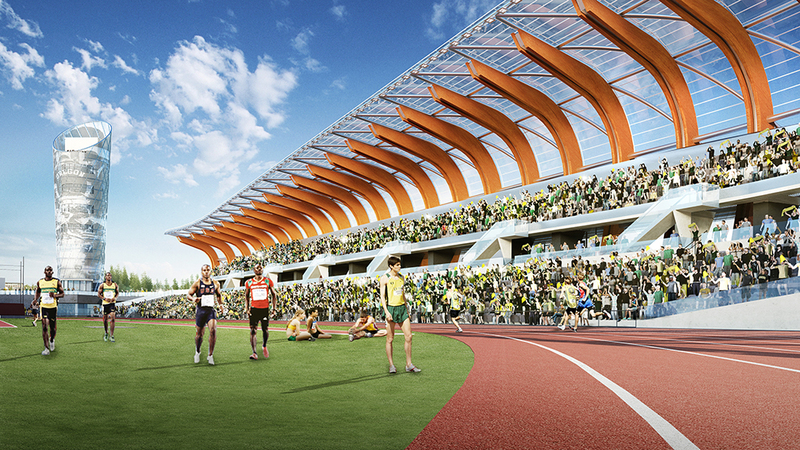 Slated to open in 2020, Hayward Field will set a new standard for sports venues, create world-class training and competition facilities for UO’s student-athletes, and incorporate new laboratories and research facilities to better understand the potential of human performance.